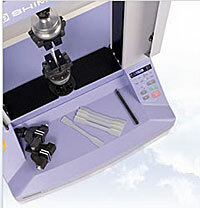 Adopts a single joint for both tension and compression tests. This makes it easier to exchange jigs. In addition, the joint is set with a nut placed in the upper part of the loading cell, which allows for safe detachment of the joint on the table. Conduct testing by calling up test methods from TRAPEZIUM LITE X software. The AGS-X can be used as a standalone tester to test specimens using test methods created with the tester itself. This allows hand-held control of the crosshead position. The jog dial makes fine positioning a breeze. 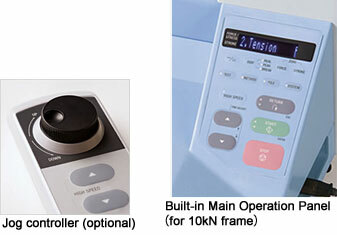 The main operation panel enables the development and storing of test conditions, allowing testing without having to connect to a PC. Perform various operations with the jog wheel, such as opening and shutting the button for automatic grips or the automatic extensometer. The main operational panel is movable, allowing convenient adjustment of the angle. Large space in front of the instrument. Perfect for placing jigs, arranging specimens, or taking notes.